Railpictures.ca - Michael Berry Photo: VIA 34 with VIA 920 and four HEP cars crosses the Lachine Canal on a snowy afternoon in Montreal. In the background, preparatory work for the REM (Réseau express métropolitain) light rail project has begun. | Railpictures.ca – Canadian Railway Photography – photographie ferroviaire Canadienne. 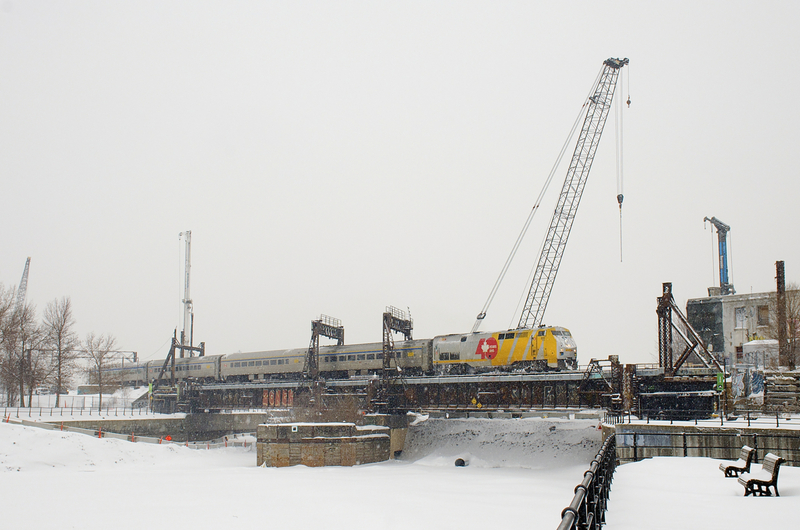 Caption: VIA 34 with VIA 920 and four HEP cars crosses the Lachine Canal on a snowy afternoon in Montreal. In the background, preparatory work for the REM (Réseau express métropolitain) light rail project has begun.